Paying it forward placed the Department of Geography on the map for Neil Conner. A mostly privately funded cushion of financial support adds to the robust learning environment of the doctoral geography student and teaching associate. Studying cultural and political geography, Conner is afforded the opportunity to conduct research abroad. He blends his travel through thirty-four countries into every Geography 101 lecture. His dissertation research about national identity in Ireland has been recognized and supported by a McClure Scholarship, a departmental McCroskey Award, a Science Alliance Fellowship, and a Seaton Graduate Fellowship. His exceptionalism as an educator has not only attracted financial support for his research endeavors, but also awards. In 2015 Conner was named one of ten recipients of the highly competitive K. Patricia Cross Future Leaders Award sponsored by the Association of American College & Universities. He received a UT Chancellor’s Honors Award for his teaching excellence in 2014. Seeing firsthand the impactful results of Conner’s efforts, Kurt (Knoxville ’84, ’86) and Susan (Knoxville ’81, ’85) Butefish have made sure a significant portion of their estate plan includes the geography department. 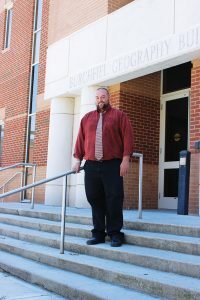 “As graduates of such a fine department and practicing professionals in the field of geography,” says Butefish, “Susan and I remain intimately connected with the department.” Butefish is coordinator of the not-for-profit Tennessee Geographic Alliance (TGA) which advances geographic literacy throughout the state. The TGA is based in the Department of Geography and housed in the Burchfiel Geography Building where Butefish has daily interaction with faculty and students. He also serves on the board of directors of the Tennessee Geographic Information Council, the largest state-level organization for geospatial professionals which includes many UT geography graduates. Conner is grateful for the support he has received. “Every investment in my research by generous individuals like Kurt and Susan makes me a better teacher and researcher,” explains Conner. Anything but a memorization game of capitals and rivers, “what I do and teach is connected to the world’s environmental and social issues,” says Conner, who taught high school geography for five years in Virginia Beach, Virginia before enrolling in graduate school. He has a bachelor’s degree in history and education from the University of Arizona and a master’s degree in international studies from Old Dominion University. In the summer of 2015 he was awarded a doctorate in geography from UT and has been working in the department as a lecturer since then. Conner’s educational impact will be magnified next fall as he becomes a teacher of teachers. He has accepted a tenure-track position as assistant professor of Geographic Education—a joint appointment in the Division of Social Studies & History and Teacher Education, Leadership, & Research—at Delta State University.